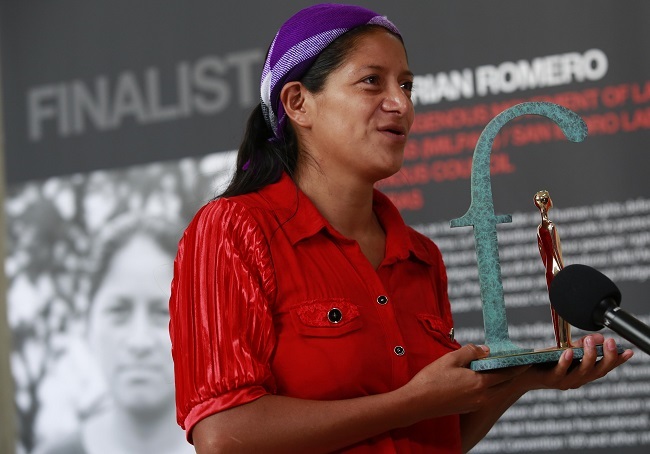 On June 9, Ana Mirian Romero, a 29-year-old indigenous Lenca woman and mother of five from the department of La Paz, Honduras, was recognized by the European human rights organization Front Line Defenders. 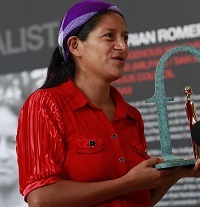 Romero was awarded the organization’s annual award for Human Rights Defenders for her work struggling for the recognition of indigenous lands and against the corporate destruction of the environment in Honduras. On June 9, Ana Mirian Romero, a 29-year-old indigenous Lenca woman and mother of five from the department of La Paz, Honduras, was recognized by the European human rights organization Front Line Defenders in a ceremony in Dublin, Ireland. Romero was awarded the organization’s annual award for Human Rights Defenders for her work struggling for the recognition of indigenous lands and against the corporate destruction of the environment in Honduras. Romero has worked tirelessly as a member of the Lenca Indigenous Movement of La Paz (MILPAH), and San Isidro Labrador Indigenous Council to gain the formal recognition of indigenous lands in the department of La Paz. These organizations have also worked to stop the construction of the Los Encinos hydroelectric project along the Chinacla River, which is owned by the Honduran Los Encinos S. de R.L. Company. In 2015, Romero and her community were able to successfully stop the construction of the hydroelectric dam. That year, after nearly five years of organizing for the recognition of their ancestral lands, the community won the acknowledgement by the state of their territory. They were also able to successfully stop the construction of the dam. Since 2015, the company has not returned to construct the project. Communities opposed the project over concerns over the negative impacts of the dam for the community’s access to water and to the environment. Furthermore, the project would displace the local Lenca communities from their fishing grounds. During her acceptance speech, Romero called on global supporters of human rights to protect the indigenous communities that struggle to defend the environment. Human, environmental and indigenous rights defenders have faced a deteriorating situation in Honduras in the years since the 2009 US-supported coup d’état against Manuel Zelaya, the country’s democratically elected president. Following the coup, Honduras was subjected to the massive dispossession of land by the state and transnational companies for the construction of capitalist development projects. Along with this dispossession came massive repression of activists and human rights defenders. Activists have faced assaults by police, military, and paramilitary forces. Romero, her husband Rosalio Vasquez Pineda, and her family have faced many violent intimidations for her resistance. These constant attacks have come from the company, police, military and paramilitary forces. These threats have led to her children being pulled from school. On January 29, 2016, Romero’s family’s home was burned to the ground. And just a month before the award ceremony, she and her family received death threats at their home in the municipality of Santa Elena, in the department of La Paz. 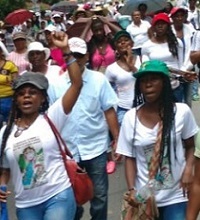 But despite this, Romero has stated that she will continue with the struggle. “I am without fear because if something happens to me, the international human rights organizations are with us,” she said. The situation in Honduras jumped to the international attention on March 3, 2016 with the early morning assassination of prominent Lenca environmental activist Berta Cárcares. The assassination of the prominent environmental activist and winner of the 2015 Goldman Environmental Award has sent shock waves across Honduras and the world. But the assassination has also driven environmental activists such as Romero to strengthen their organizations and to continue working for change in Honduras. The other countries of Central America see a similar deteriorating situation. This has concerned human rights organizations such as Frontline Defenders.